This is an article appearing in Journal from The Newton Institute, TNI, Stories of the Afterlife, May 2018, by Dr. Ann Clark, Director of Research, and is viewable at Research section for May, 2018. Please click link to view the entire article and to visit the TNI website for more information on LBL. I am pleased to share information about the research of Marcus Sorensen, MSc, TNI Research Committee member, in this issue. This research comes from Marcus’ master’s thesis, completed as part of a Neuropsychology program, at the University of Kent in Canterbury, England. 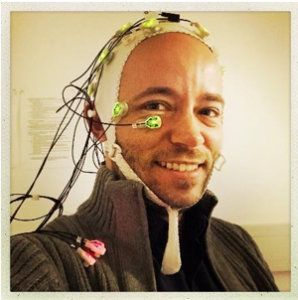 His research was entitled Life between Lives (LBL) Regression Hypnotherapy, as measured via EEG (Electroencephalogram). He set out to investigate the differences in brainwave states between different phases of the LBL regression experience. His objective was to better understand how LBL hypnosis clients’ profound insights arise, neurologically speaking. Marcus hypothesized that there would be observable differences in brainwave states between the induction, deepening and experiencing phases of the LBL hypnosis experience. The experience was compressed into one hour to make the experiment feasible within the laboratory setting. Thirty-four subjects were recruited through social media to participate in the quasi-experimental study. Subjects ranged in age from 18 to 70 years and three-quarters were female. Subjects had no history of psychiatric illness, were currently free of any psychotropic medications or substances and scored at a normal or higher level, indicating how hypnotizable they were. 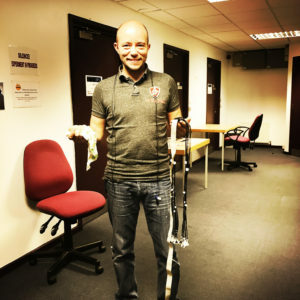 Marcus created an audio recording with the three phases of hypnosis experienced in the typical LBL journey. In the last 20 minutes, where the Experiencing phase took place, subjects were invited to enter a white room that contained a golden bowl and a spiritual presence, both of which represented the types of discoveries that may arise in the spiritual domain of the inter-life. The spiritual presence is revealed to be their higher self. After the individual completes the interaction with their higher self, the third phase is finalized by a standard LBL regression hypnosis emergence procedure. This includes suggesting ways for the individual to integrate the experience of the hypnosis journey and bringing them back to awareness of their body and the environment around them. 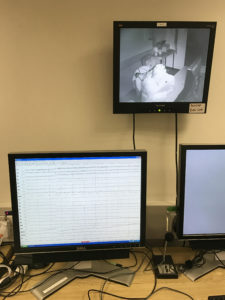 The hypnosis instructions were pre-recorded to make the experiment suitable for proper EEG data analysis, as there would have been too much variation in what was going on at different times of the experience if there had been live interaction with the participants. 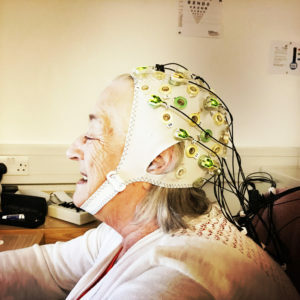 Each laboratory session lasted approximately two hours per participant, with 30 minutes of briefing and setup, 60 minutes of hypnosis with EEG recording, and 30 minutes of verbal survey, clean-up and integration afterwards. During the set-up, headgear with EEG electrodes were placed and secured. For the hypnosis, participants were seated alone in an air-conditioned and sound-attenuated room where the recording was played from loudspeakers adjusted by each participant to their preferred volume setting. Participants were instructed to close their eyes, and not to fall asleep or move for the duration unless necessary. Lights were turned off prior to commencing the hypnosis. At the end of the recording, the participants were brought out of hypnosis, and given time to integrate the experience. A follow-up interview was conducted immediately after the hypnosis and a follow-up questionnaire was sent out two weeks afterwards to check for longer lasting effects. EEG data were processed in Brain Vision Analyzer software in several stages for each participant. Statistical analysis on group data from all 34 participants were analyzed with SPSS, using descriptive statistics and one-way Analysis of Variance. There was a significant increase in Alpha wave activity between the induction and Experiencing phases in the parietal electrodes. It is normal to expect more Alpha wave activity in this area once the eyes are closed, but what was unexpected was that the Alpha waves continued to increase throughout the experience. This indicates that participants went into a state that was far detached from their physical bodies’ input, especially during the Experiencing phase. Another unexpected finding was that the Theta wave activity in the frontal electrodes decreased significantly between the Deepening and Experiencing. 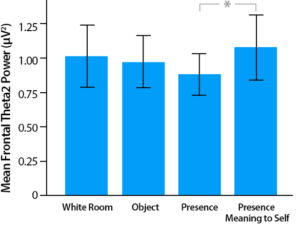 An increase in Theta wave activity was expected as participants entered the white room and started interacting with inter-life-related objects and presences, since Theta wave activity is associated with having emotional experiences, as well as retrieving and creating new memories. This prompted Marcus to analyze the different subparts of the Experiencing phase in more detail to try to understand what was happening. He then examined entering the white room, focusing on the golden bowl, focusing on the benevolent presence and discovering that the presence is one’s higher self. The theta band frequency was divided into two commonly used sub-bands of Theta 1 and Theta 2. Previous research has shown greater activity in Theta 2 when hypnosis is compared with meditation, and thus examining the narrower Theta 2 band may prove more revealing than looking at the whole theta band. He also examined Gamma frequencies, which have been correlated with sensory and cognitive association, especially related to imagery. Here is what he discovered. Marcus discovered a significant increase in Theta 2 power between Presence and Presence meaning to self. This is what he expected. Secondly, he found a significant decrease in the Gamma waves between Presence and Presence meaning to self. According to Marcus, the significant decrease in narrow-band frontal Gamma power (38-42Hz) observed between the Presence Focus to the Presence Meaning to Self-sub-phases makes sense when considering that this Gamma frequency is observed during sensory and cognitive association tasks in the brain. 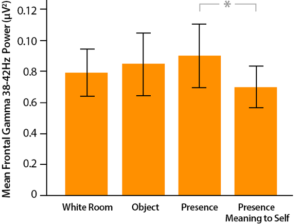 In focusing on the spiritual presence, participants were specifically invited to “notice the difference in feeling or color or intensity” of the presence, which would plausibly activate multiple sensory neural networks and thereby increase narrow-band Gamma power with the integration of the subjective sensory experience with thoughts. The results of this research create a challenge to notions that an inter-life experience has to take place in a specific brainwave state. It is interesting to note, that there are effects that happen just because we have our eyes closed for a long time, and other effects that fluctuate depending on the perceptual or emotional experiences we are having. Marcus posits that the relative quietness of the parietal lobe over an hour or longer allows us to be detached from our physical experience during an LBL Regression Hypnotherapy journey, which in turn allows us to go deeply into our own inner landscapes. He suggests that the interplay between Gamma and Theta frequency found in the frontal lobe are linked with the possibility of having vivid sensory and emotional experiences in that setting. Dr. Ann Clark, PhD, TNI Director of Research is a Certified LBL Hypnotherapist practicing in Birmingham, Alabama, USA.